Established in 1993, our Studio Company gives upper level students significant performing opportunities throughout the year, including two annual concerts presented to the public in February and May, as well as performing in CCD’s The Nutcracker, and lecture demonstrations to Broomfield and Boulder County elementary schools. Studio Company dancers maintain classical and contemporary repertoire, rehearsing and studying 20-25 hours per week from August to June. 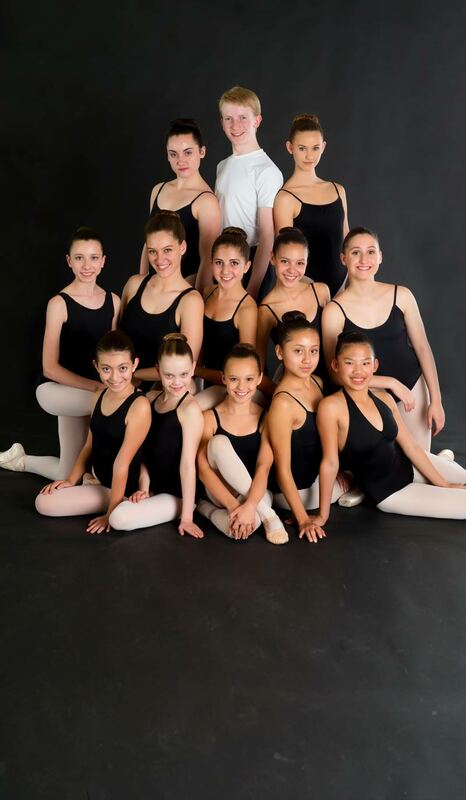 This group of dedicated dancers is also individually coached in preparing classical variations for the Denver Ballet Guild Young Dancers Competition held each March. Students who are in Advanced 2 Beginning Pointe or higher and have met Nutcracker summer training requirements are eligible to join the Studio Company. There is a non-refundable participation fee of $500 (which includes participation in The Nutcracker). Students may also audition for a la carte – please keep an eye out for further information. Auditions for 2018-2019 Studio Company Members were held on August 14. Advanced 2 – at least 3 ballet classes, 3 beginning pointe (ladies), or 1 Men’s class (men) + 1 additional ballet, composition, contemporary, and either jazz or modern. Advanced 3 – at least 4 ballet classes, 3 pointe (ladies), or Men’s class (men), Pas de Deux, Composition and two of the following: jazz, modern or contemporary. Advanced 4 – at least 5 ballet classes, 3 pointe (ladies), or 1 Men’s class (men), Pas de Duex, Composition, Contemporary and either jazz or modern. Training requirements must be fulfilled through enrollment in classes at Colorado Conservatory of Dance. Congratulation to our 2018-2019 Studio Company members! Make sure to not miss our 2018-2019 season! Advanced 3/4/PPP August-December varies with Nutcracker roles. January-June 2-7pm.